Some of you may know my personal story (if not, take a quick read here) and my background (and slightly disturbing love) of statistics. Along with science, numbers provide order in the world and design is sometimes all about order. How does one bring math and science into their designs? There are some fun and creative ways to bring the hard sciences into our interiors. Here are just a few inspirations to get your started. Let's get started...1..2..3.. Use numbers as a counting lesson on your stairs. 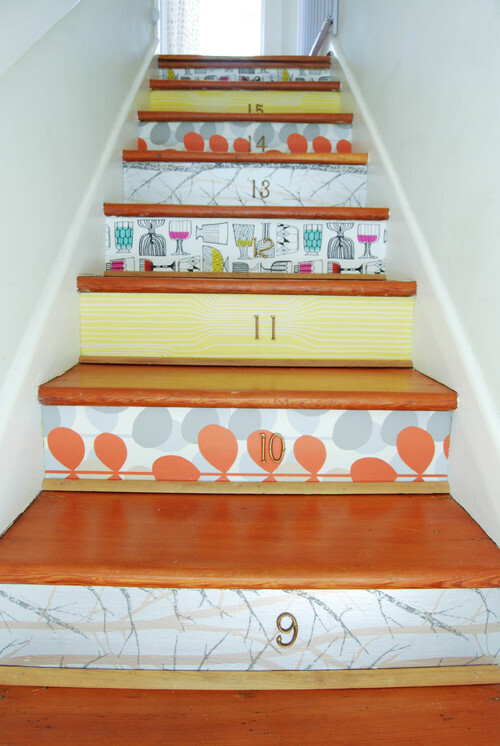 These creative stairs use numbers and fun patterns to spice up what would be an otherwise normal set of risers. Numbers as art. This simple painting of numbers creates an immediate graphic statement in the room. Typography, whether numbers of letters, provides structure to the piece and gives viewers something to ponder. Is there a pattern in the art? Would be fun to figure that out. Geometry extends our mathematics theme. One of my favorite classes in high school was geometry. I love the idea of structure and angles, intersections and degrees. Geometric designs in interiors are the known played against the unknown (pattern against the chaos). This simple geometric light fixture plays nicely with the less structured pattern in the drapery and bedding. Molecules are the building blocks. 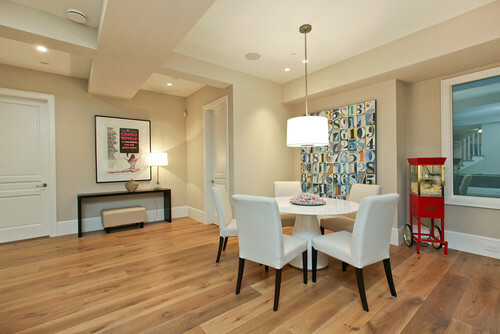 The design of this dining room is set off completely by the molecule inspired chandelier by Lindsey Adelman. From there you can see the cell inspired fabric in the chairs and the geometric design in the rugs. Simple structures all in an elegant setting. The great biology experiment. For the slightly more macabre, go with a Frankenstein-inspired look. 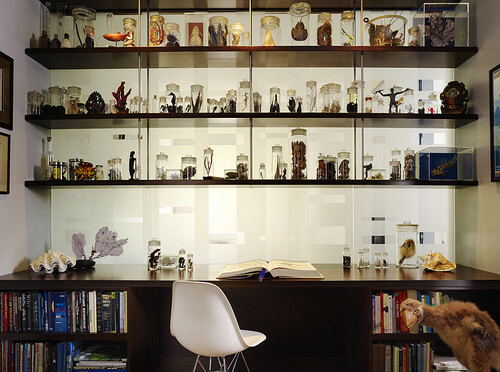 This desk area is decorated with jars of aquatic specimens. Who knows what ghastly creatures could be thought up in such a lab - followed by sinister scientist's laugh. I hope these ideas have inspired you to bring either math or science into you interior design. I know I'm thinking about ways to bring these into my own home.